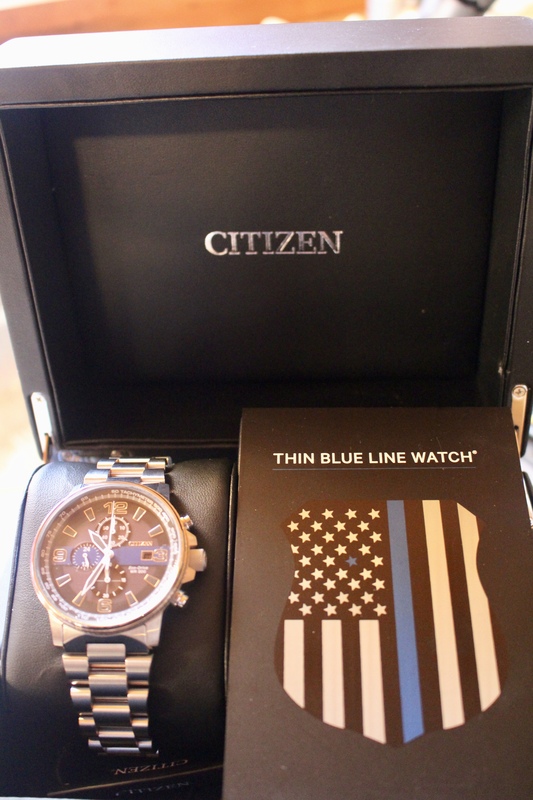 I have a confession to make – I tend to be obsessed with analyzing my blog statistics. 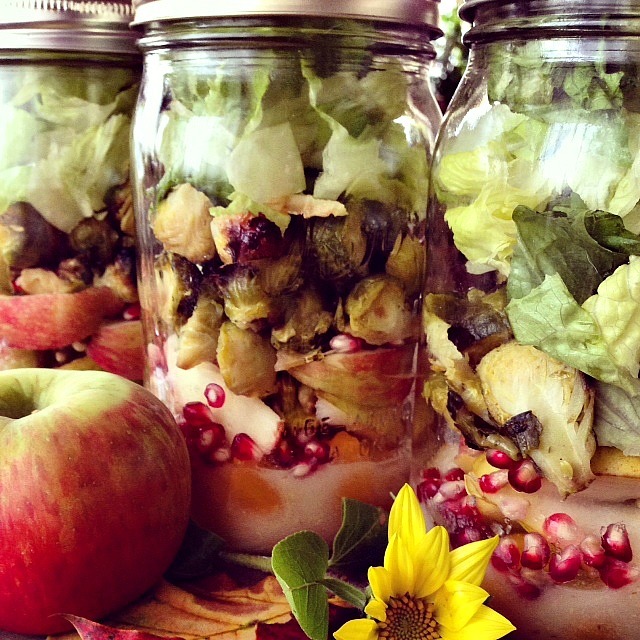 On a daily basis, without fail, my most popular posts are my Mason jar salads. It is easy to understand why. 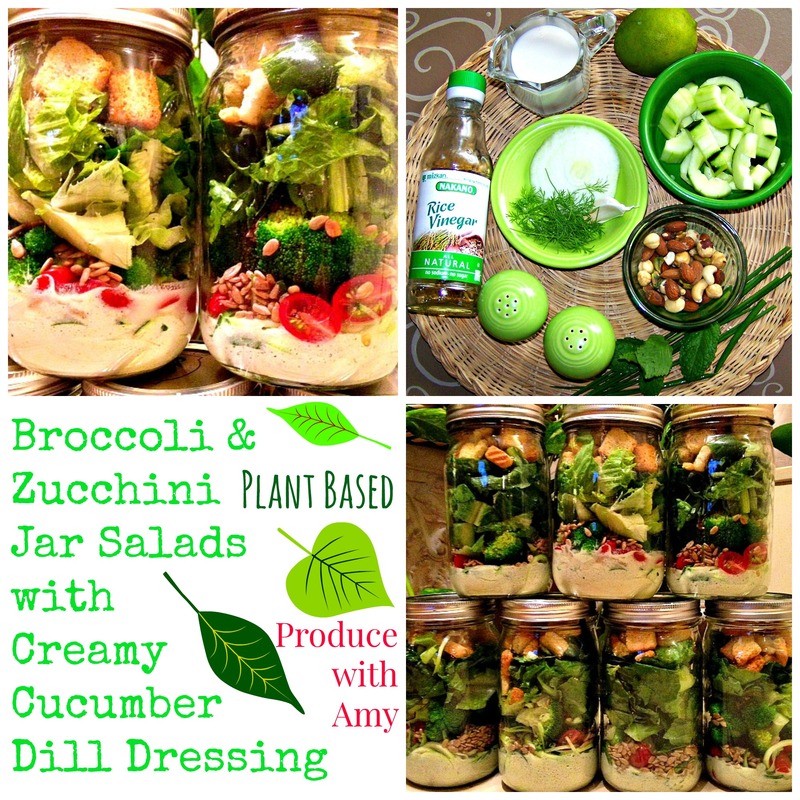 Discovering the efficiency, versatility, and freshness of jarred salads can be life-changing. 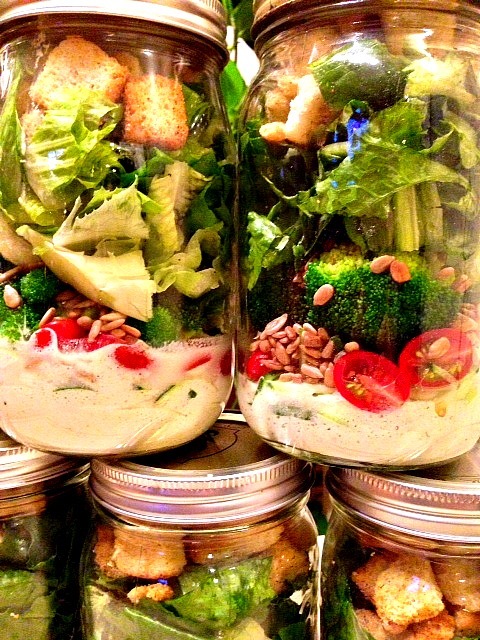 They have transformed my lunches and the way that I look at salad ingredients. 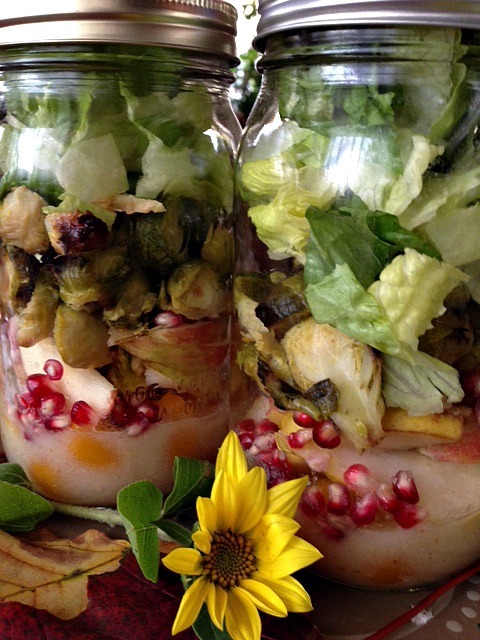 When others expressed interest in my recipes I strove to come up with creative, vibrant, and nutritious combinations and the result was over twenty salads with homemade dressing. 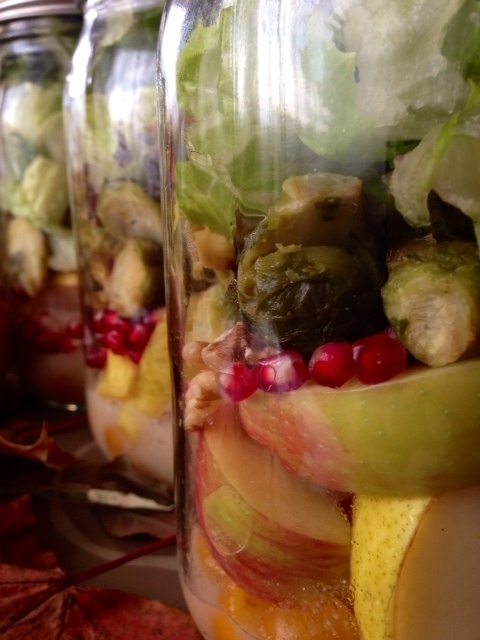 In fact, I still feel the pull to keep creating and today I will share with you my latest jar salad creation. 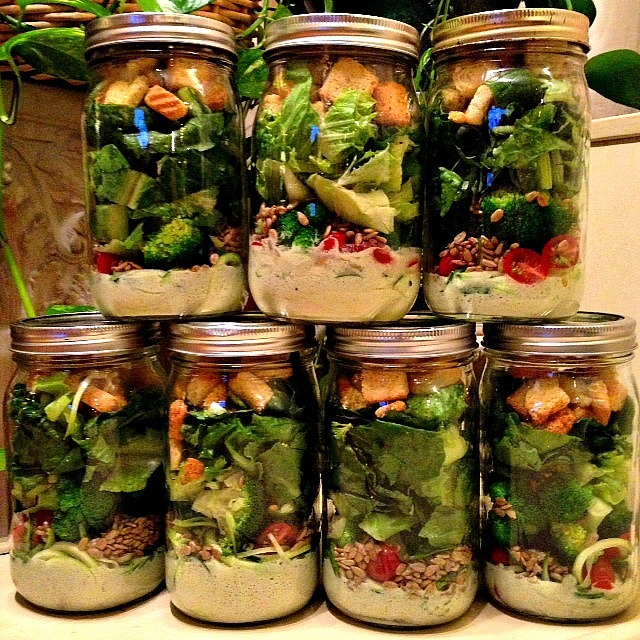 If jar salads do not fit into your lifestyle, my salads can be plated for your enjoyment as well. 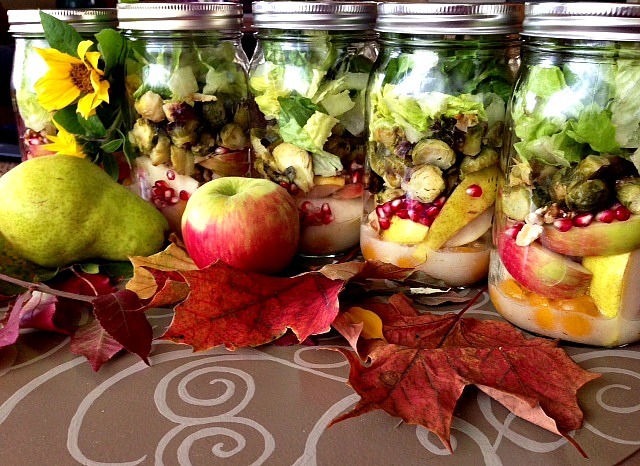 If you are new to Mason jar salads I suggest that you read this post for tips, tricks, and suggestions. 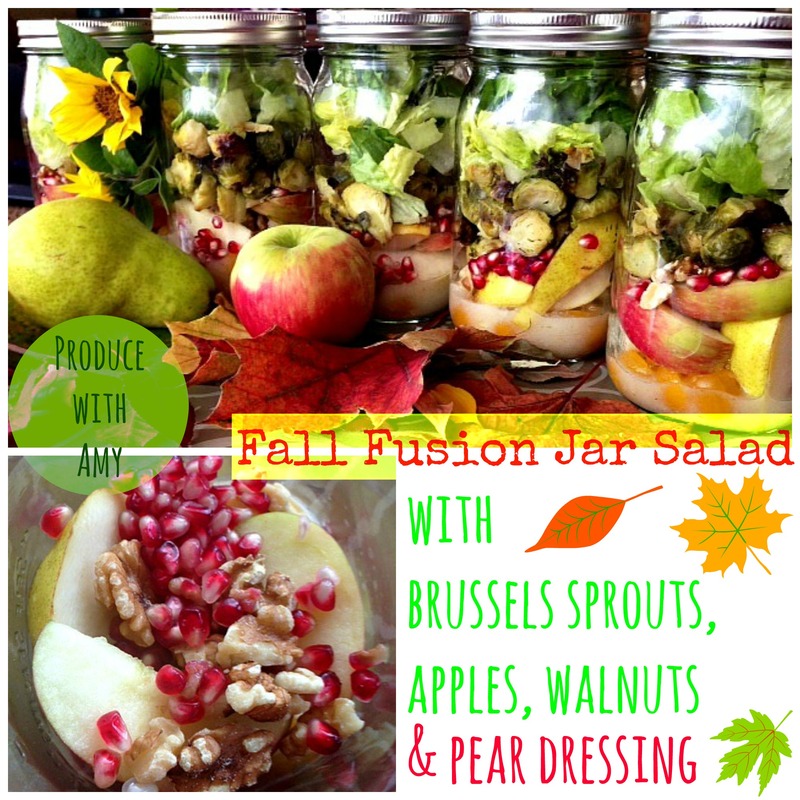 My wish was to create a salad that would bring some of my favorite fall flavors together. 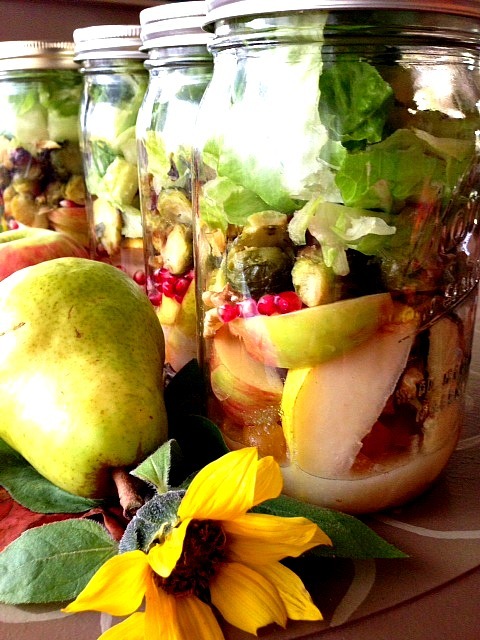 What speaks more of fall than crisp apples and juicy pears? 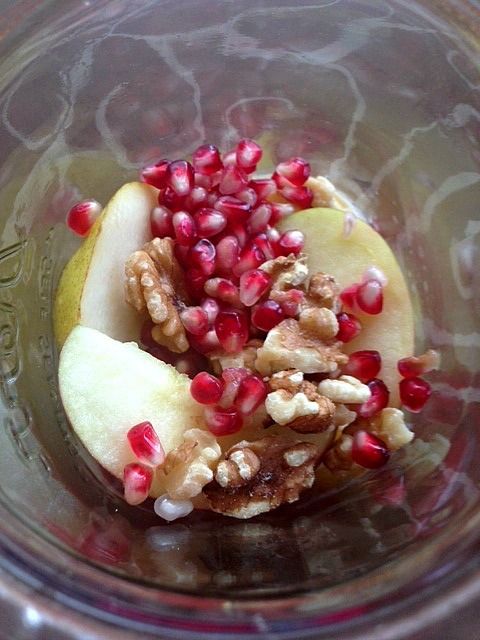 When I spotted a pomegranate at our local co-op I knew that it would be the perfect addition. I also decided to roast Brussels sprouts to bring out their sweetness and the result is an unforgettable salad that I hope you enjoy as much as I did. 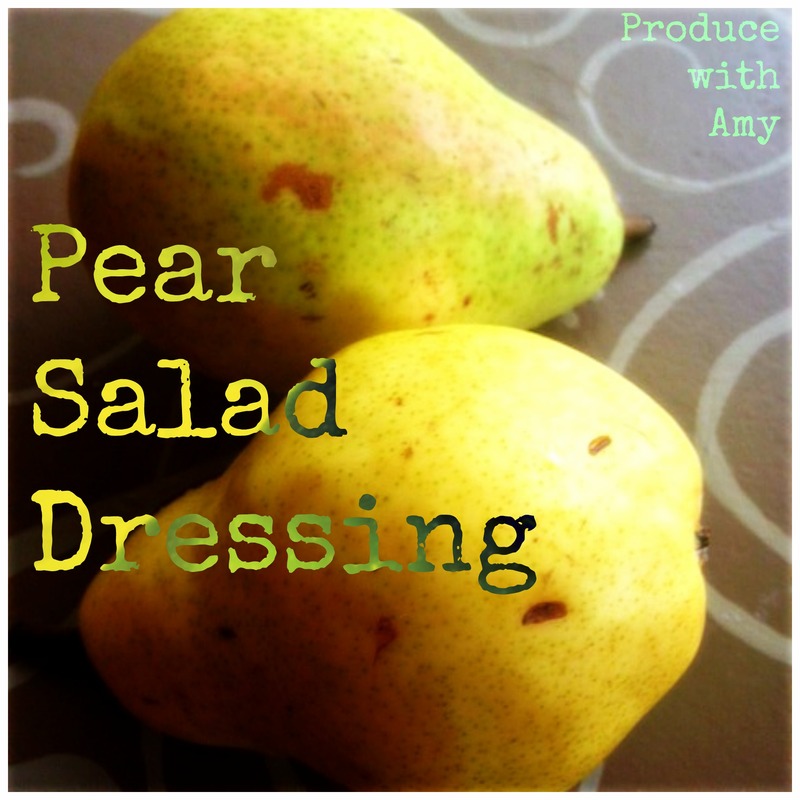 Not only is this salad brimming with fall flavor but it is also packed with fiber to help keep you full. 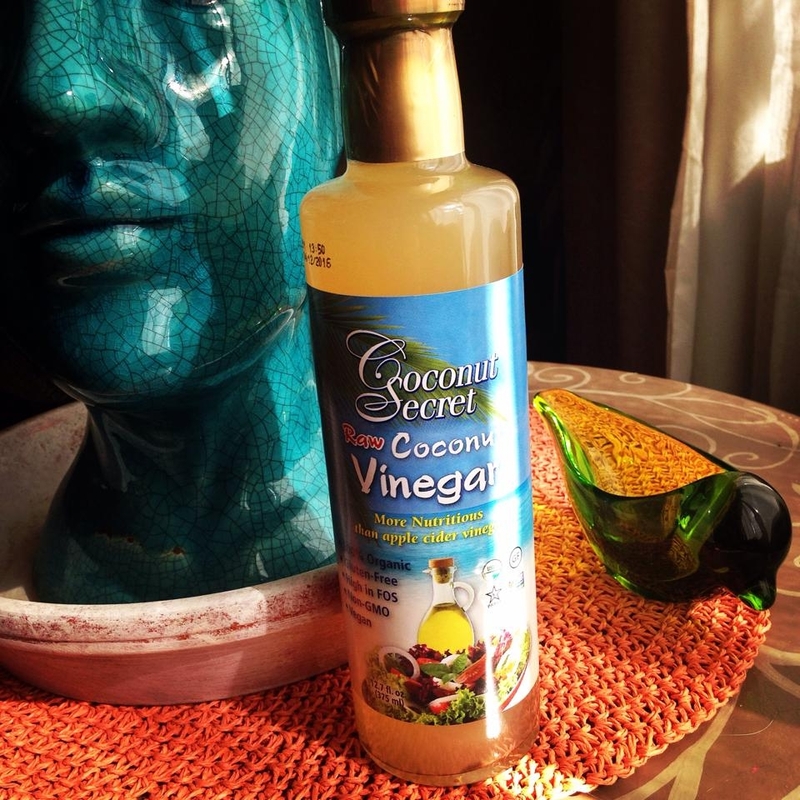 I found raw coconut vinegar at our local co-op. 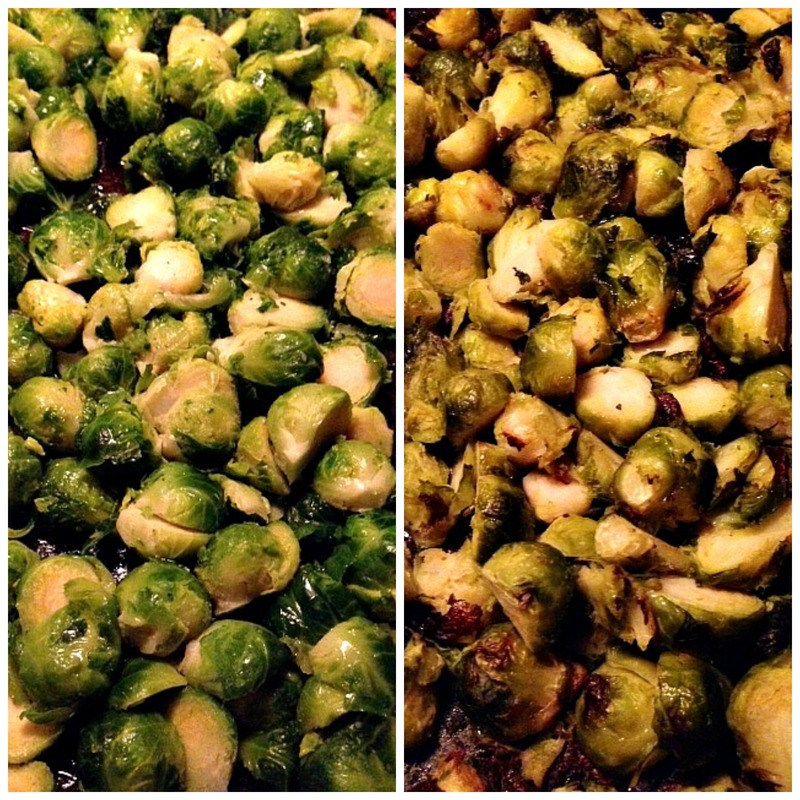 Cut Brussels sprouts in half and spread on baking sheet. Drizzle with a little bit of olive oil, sprinkle with salt, pepper, and two cloves of minced garlic (toss well). Roast at 400 degrees for 45 minutes (depending on oven). Turn sprouts at the 20 minute mark. 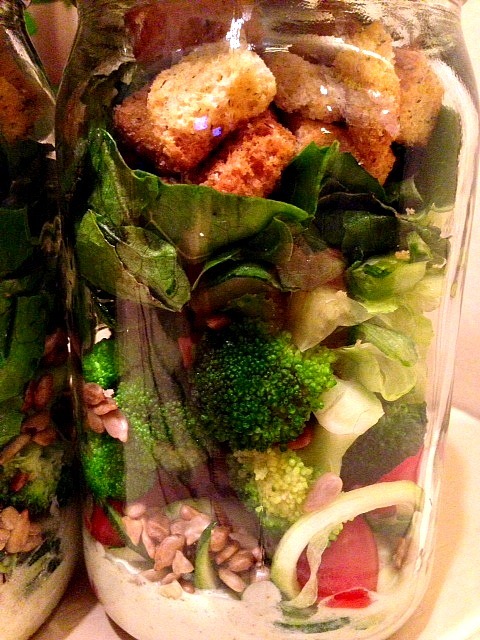 Allow to cool before adding to the salad. 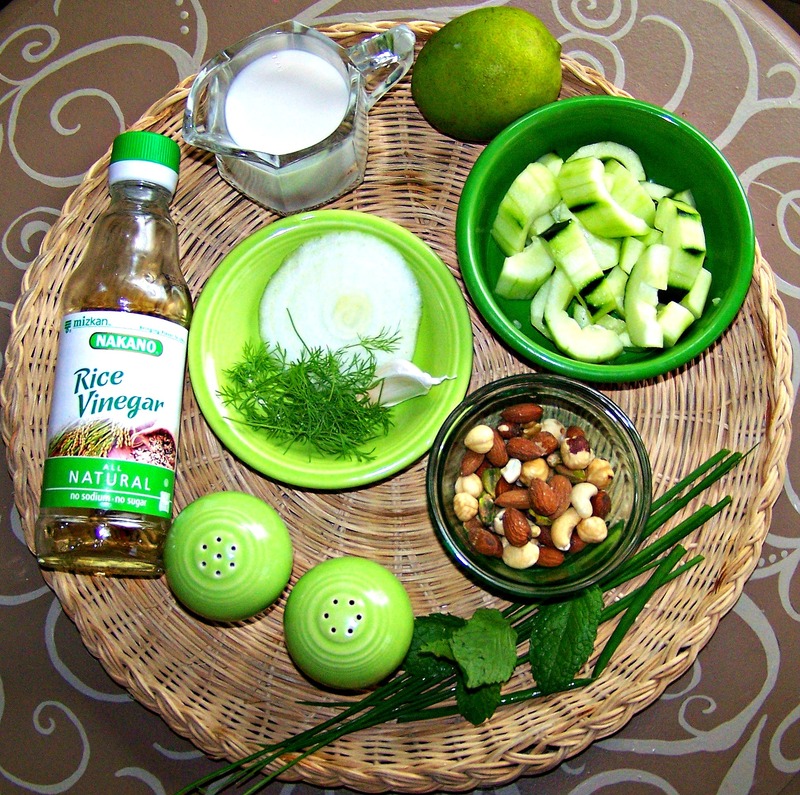 Make sure you check out my other Salad Recipes. 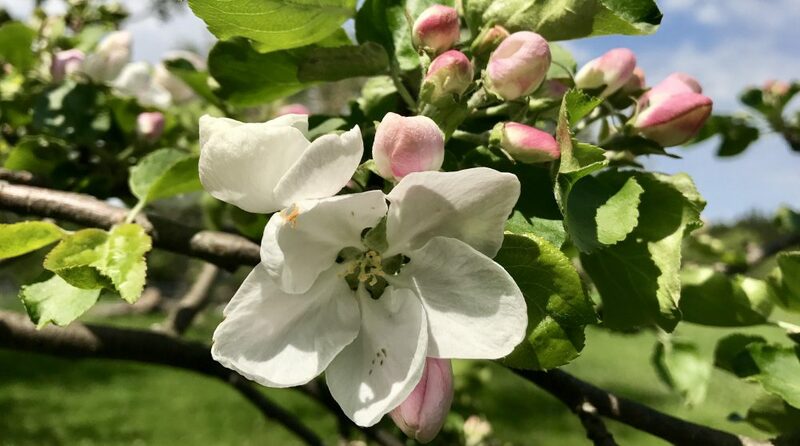 Thank you for reading and I would love to hear how you found your way to my blog. Make sure to subscribe to my new posts via email and follow me on Twitter, Pinterest, and Instagram (links are on the right had side of the page). I love being part of healthy community and learning from each other. I hope you enjoy my salads. 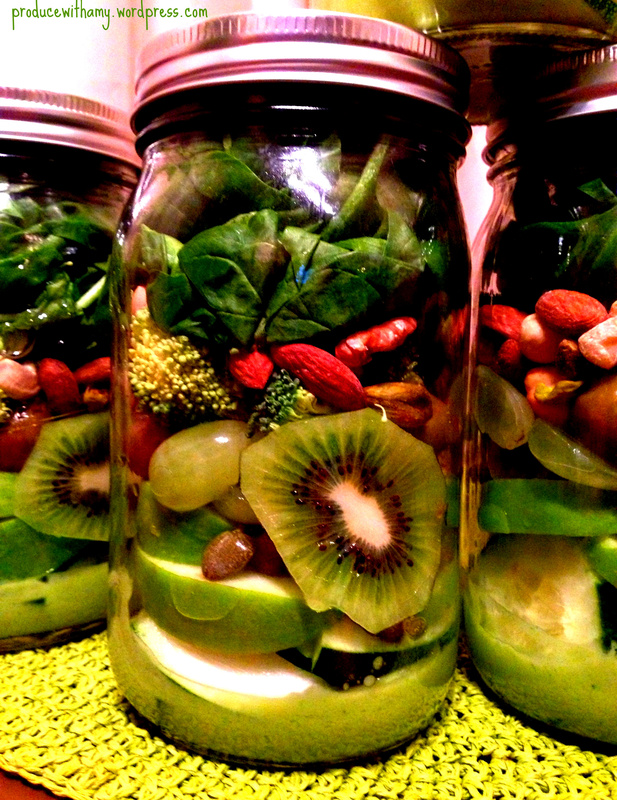 Cheers to our health and thriving together! My heart is not feeling autumn joy this weekend. The sky is gray and yesterday my husband Mike fired up the furnace. I guess when the inside temperature dips below 60 it is sign that it is time to rely on artificial heat. To help deal with my seasonal funk I made time to read, write, and I cooked up a storm. 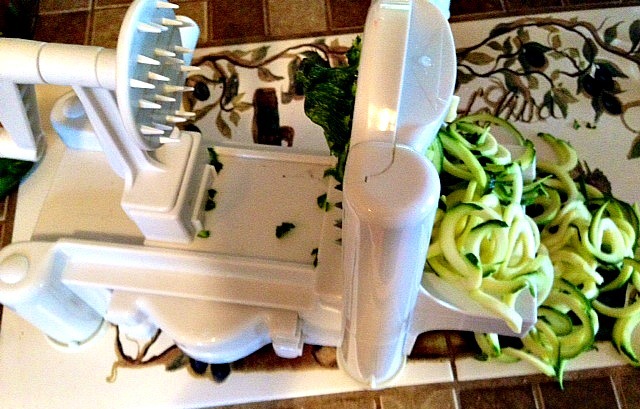 Chopping vegetables is therapy for me. Instead of turning to unhealthy food for comfort this coming week I decided to stock our house with an abundance of vegetable rich meals. 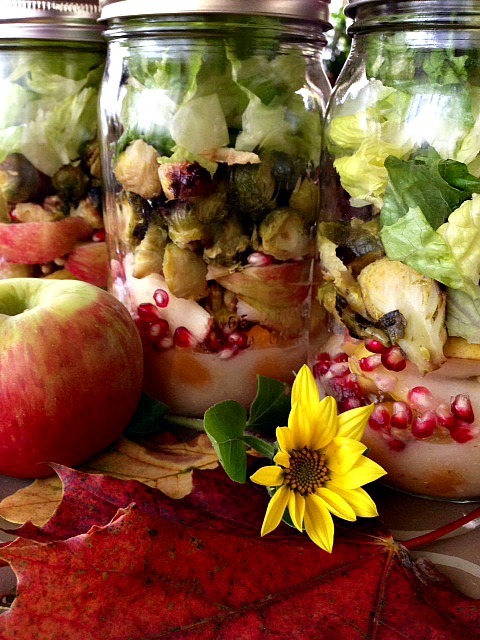 I made a batch of autumn themed Mason jar salads, vegetable lasagna, and a rustic roasted vegetable stew (the salad and lasagna recipes will be shared soon). Do you roast vegetables? It is a simple technique that brings out the sweetness in produce and makes the house smell incredible. 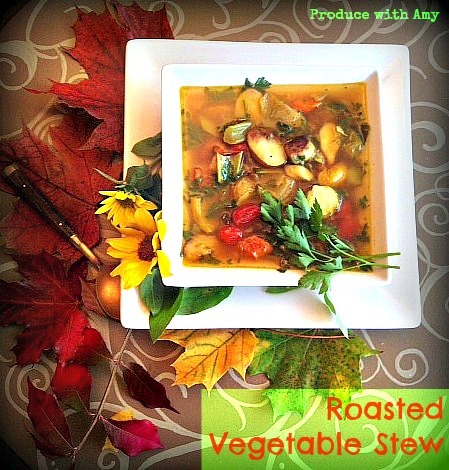 When making this stew you may want to make extra roasted vegetables to use in other recipes and serve as a side during the week. 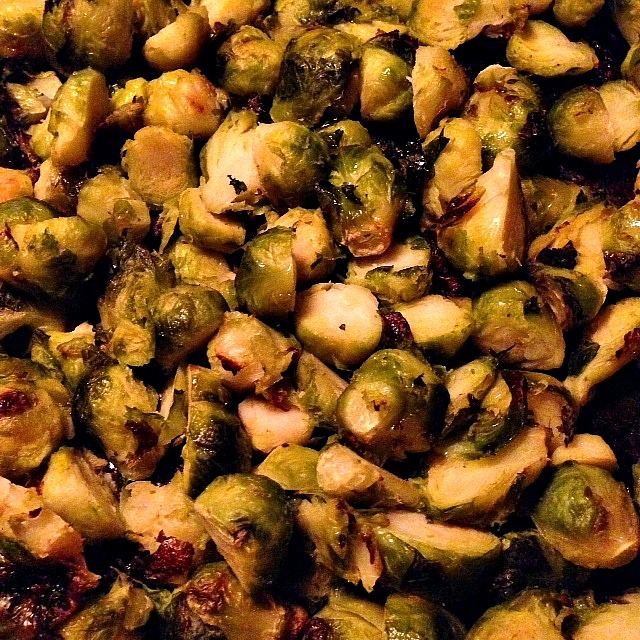 *Brussels sprouts (you will need 1 cup for this recipe. I roasted extra for my jar salads for the week). 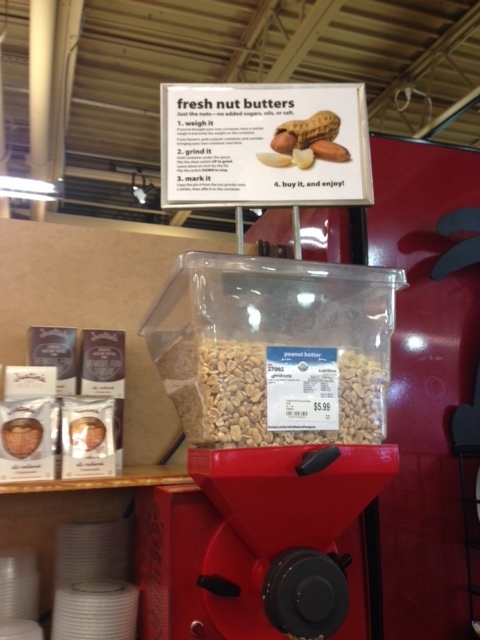 If you are buying fresh, buy 2 cups (they shrink) or one bag of frozen. 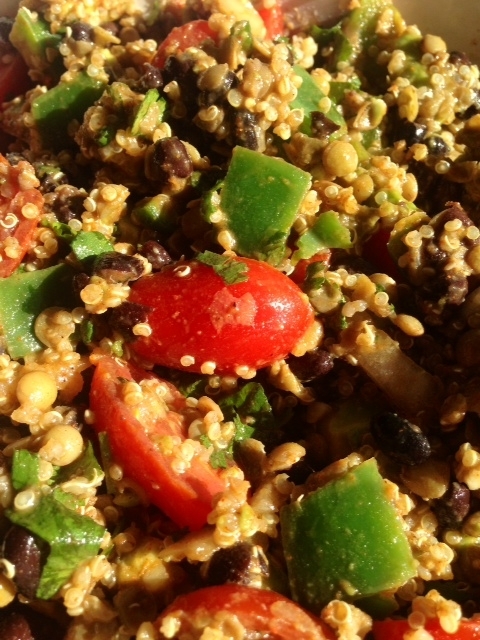 *1 pint of cherry tomatoes (I add the cherry tomatoes in the last 15 minutes of roasting). 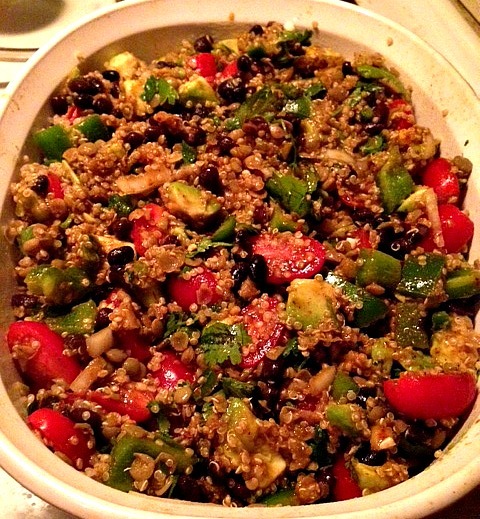 This recipe rendered 4 cups of vegetables. I used two cups for this stew and 2 cups for my vegetable lasagna. Therefore, you may want to cut the recipe in 1/2. I did not season any of my roasted vegetables since the stew will be seasoned. I chopped, drizzled with a little olive oil, and roasted for approximately 40 minutes (turning at the 20 minute mark) at 400 degrees. 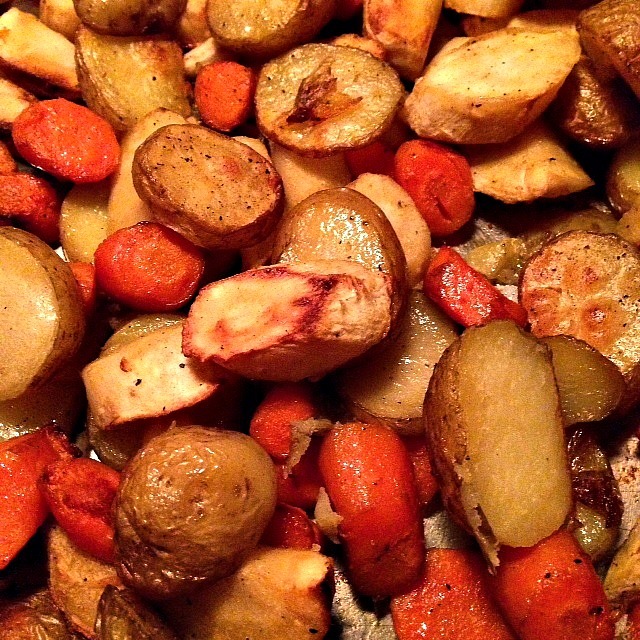 The carrots, parsnips, and potatoes were roasted for 50 minutes. 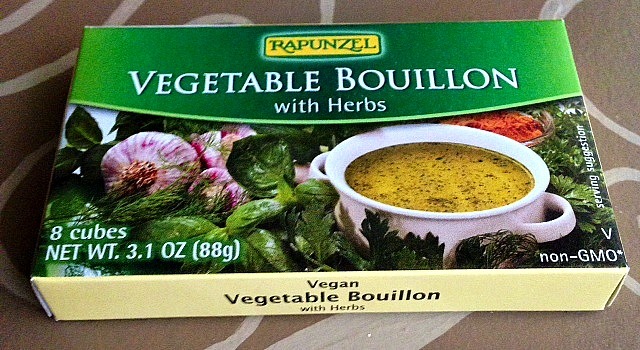 If I was roasting the vegetables to serve as a side I would also add salt, pepper, and minced garlic. This weekend I also roasted 3 heads of garlic. 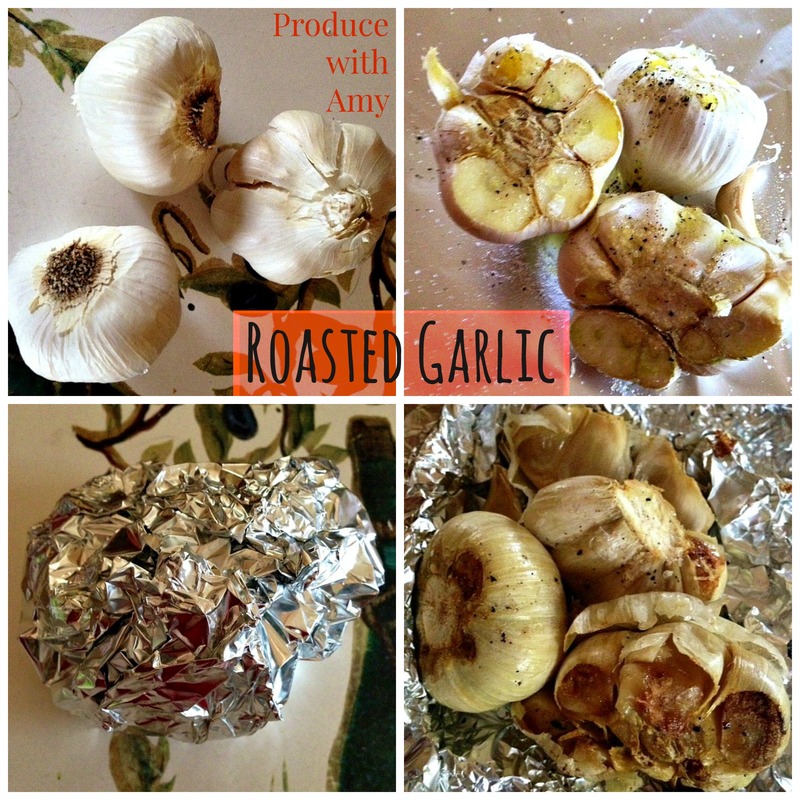 If you have never roasted garlic before, you have to try it. Roasting garlic makes it sweet, mellow, and creamy. 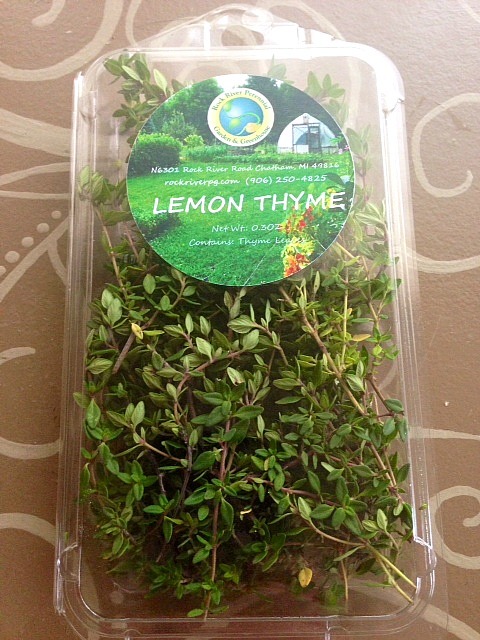 It is terrific in hummus, spread on bread, and is great in any recipe that calls for garlic. 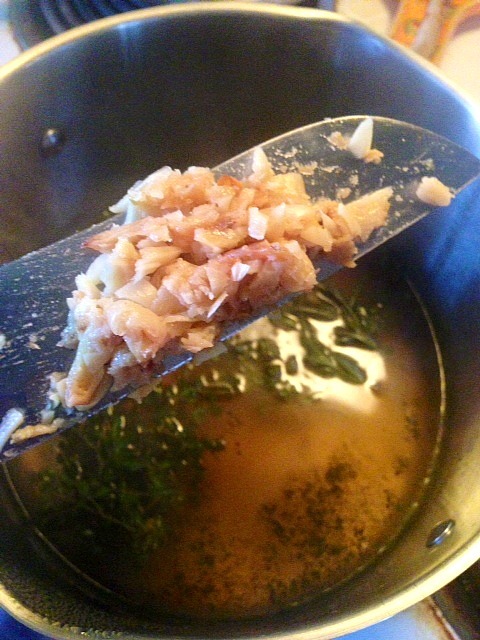 I added one entire head to this stew but if you are using regular garlic you can use a couple of minced cloves. Slice the end off of the garlic bulb (the wider end). Drizzle with a little olive oil, sprinkle with salt and pepper, and wrap in tinfoil. Pop into a preheated oven and bake for 30-40 minutes at 450 degrees (depending on your oven). After roasting the garlic flesh will become soft and will slide right out of the bulb. 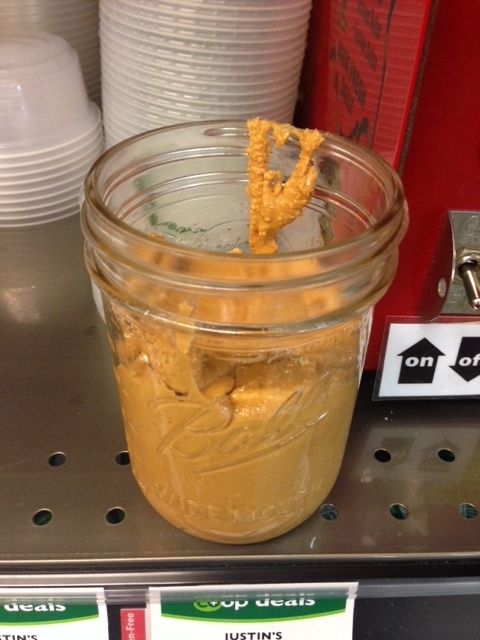 It’s marvelous spread on bread, in hummus, and works well in any recipe that requires garlic. I always use all of my roasted garlic immediately, but it would keep well for a week in the refrigerator in an air-tight container. 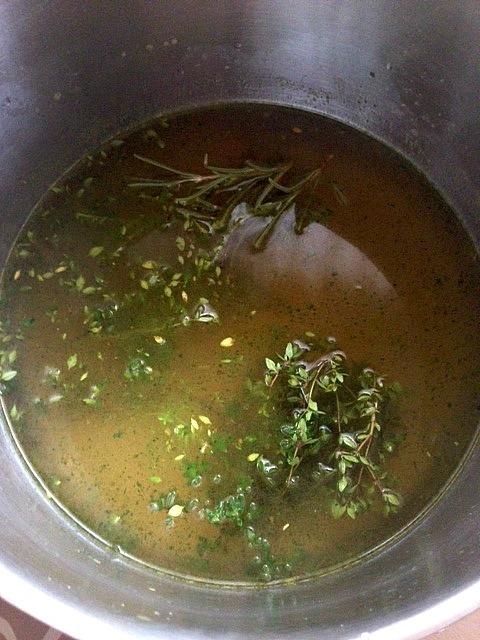 Bring vegetable stock, roasted garlic, and fresh rosemary and thyme to a boil. Simmer for 15 minutes. 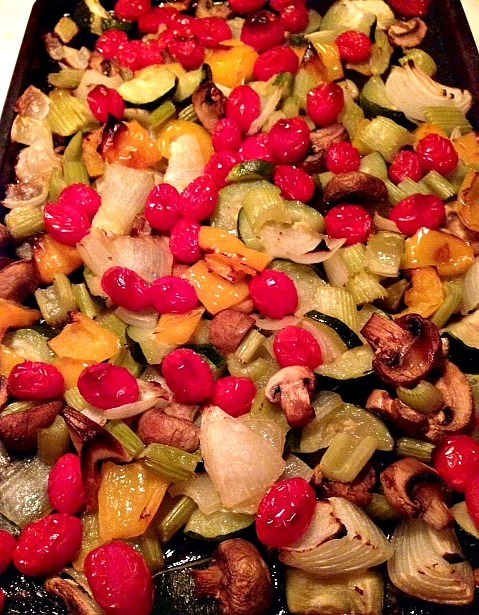 Add all the roasted vegetables and simmer for 20 minutes. 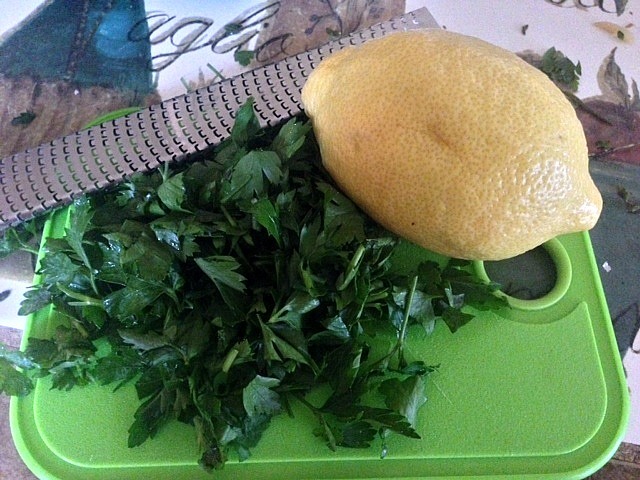 Remove from heat and add lemon juice and zest and stir in chopped parsley. 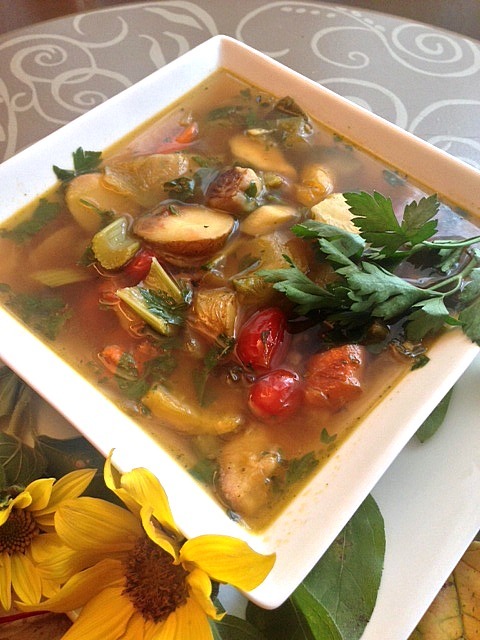 If you are like me and enjoy a steaming cup or bowl of soup to help chase away a chill and bulk up a meal – make sure you check out my other soup recipes. 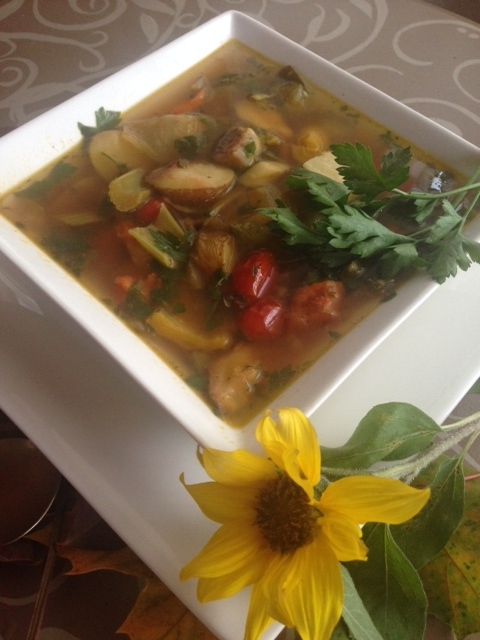 As the cold weather progresses, I promise to share more ideas for healthy comfort food. 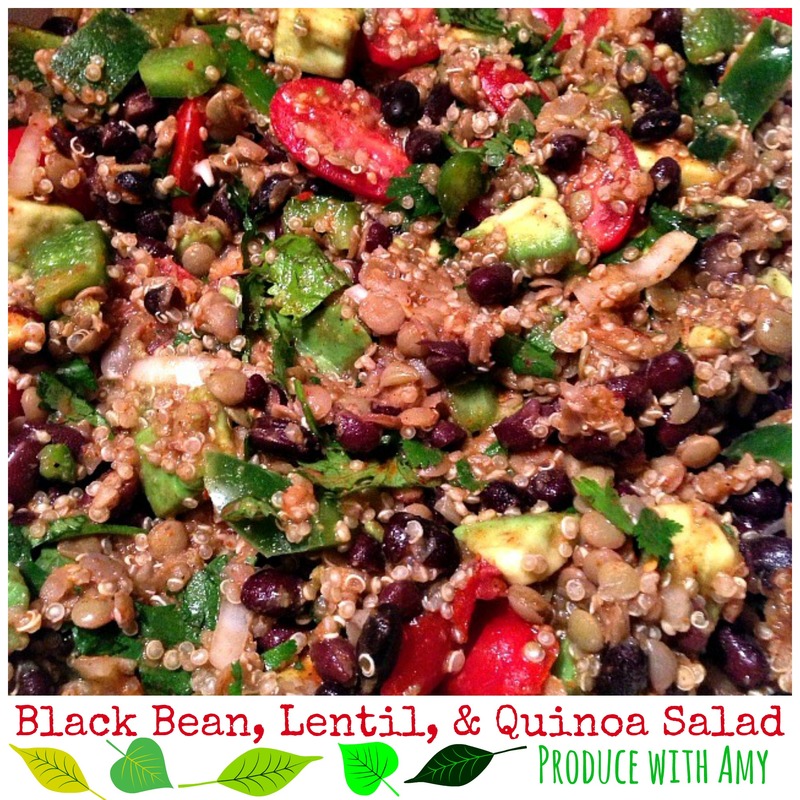 Thank you for joining me on the quest to enjoy plant-based meals. 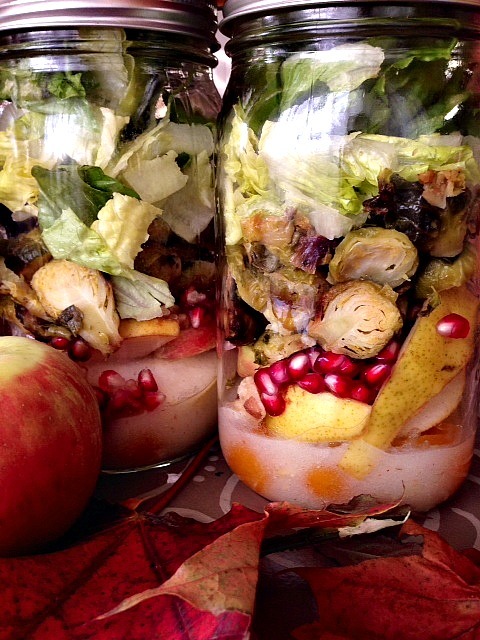 If you have a favorite fall or winter recipe – please share. Make sure you stop by my Facebook page and join the conversation. I wish you a healthy and productive week!